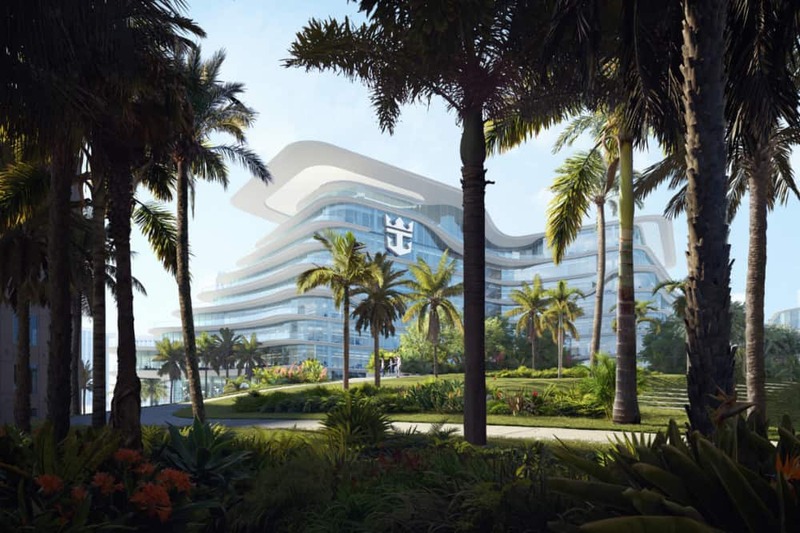 Royal Caribbean Ltd has released renderings of a new expansion to its headquarters based in Miami, Florida. To keep with the new wave of cruise line developments at PortMiami Royal Caribbean Ltd which owns cruise lines such as Royal Caribbean International and Celebrity Cruises plans on expanding its main headquarters. The cruise company has released the first renderings of its new 10-story 350,000 square foot complex located at Port of Miami at Biscayne Bay. If you ever have departed the port on a cruise vacation the current Royal Caribbean buildings can be seen. The design of the new futuristic buildings has been inspired by the flow and design of cruise ships. The modern development will include plenty of green spaces with places to relax and a new parking facility. The cruise company will also be moving into sustainability at its new expanded headquarters with electric car chargers, a green roof, photovoltaic cells, and rainwater collectors. Also Read: Reasons Why Cruises from Miami are Worth It! Construction is expected to begin in June 2019 and is scheduled to be completed towards the end of 2020. The new complex from Royal Caribbean Ltd is part of a new wave of developments at the PortMiami area. The cruise company opened its most advanced cruise terminal ever in 2018 just in time to welcome the world’s largest cruise ship Symphony of the Seas. A new modern Norwegian Cruise Line terminal is currently under construction at the cruise capital of the world. MSC Cruises and Virgin Voyages have also revealed plans for their new terminal developments coming to the port. Royal Caribbean has canceled three Oasis of the Seas sailings after a crane collapsed onto the ship during dry dock in Freeport, Bahamas.